Captain of Indian Football team and Captain of Maldives Football team shaking hands at the conference room in Bangladesh Football Federation House on Friday. Maldives national football team head coach Petar Segrt said they are ready to take the challenge of India in the final where the Maldives was able to reach after nine years. 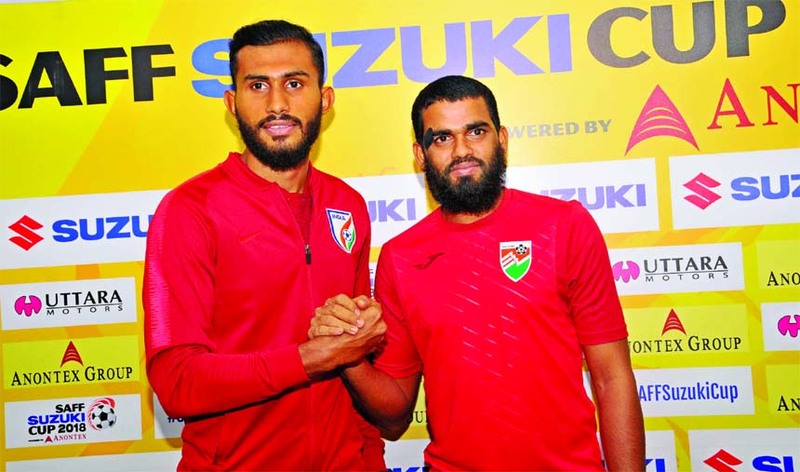 Maldives will take on defending champions India in the final of the SAFF Suzuki Cup scheduled to be held today (Saturday) at Bangabandhu National Stadium at 7 pm. "India is big team……we respect India, but we are also ready to take their challenge," he said to the reporters at a pre match press conference held on Friday at conference room of Bangladesh Football Federation Bhaban. SAFF …. I am very proud of my players, staffs, assistant coach as they worked hard and steered the team towards the final,"
The Maldives coach said the whole team is united now before the big final match and boys are also ready to take the pressure. He also expressed hope that they would able to give their maximum efforts in the final. Petar, however, admitted that their performances were not up to the mark in the group stage but tomorrow is the different game hoping that the team to come out successfully in the final. Maldives captain Akram Abdul Ghanee, who was present at the press conference, said: "We had been struggling in the group stage matches and finally we were able to reach the final after nine years. … It's a big chance for us and we're ready to win the match against India."